Toronto – Odon Wagner Gallery is pleased to announce the opening of Waterways, an exhibition of paintings by Chinese artist Wang Yihua. These canal scenes of Zhou Zhang depict a 900 year-old city, where sixty percent of the houses survive in their original state from the Ming and Qing Dynasties. The paintings are executed in a style of high realism, inviting the viewer to enter the ancient scenery. Although we have offered paintings by Wang Yihua for many years, Waterways is the artist's first solo exhibition at Odon Wagner Gallery. The high demand for these works, combined with the artist's time-consuming methodology, make this highly anticipated exhibition a rare event. Discussing the work, Yihua refers to "an indescribable sense of yearning and nostalgia for home". The sincere emotional content of the paintings is evident, and the artist has a remarkable ability capture our imagination, and transport us to the beautiful villages of the Jiangnan region. 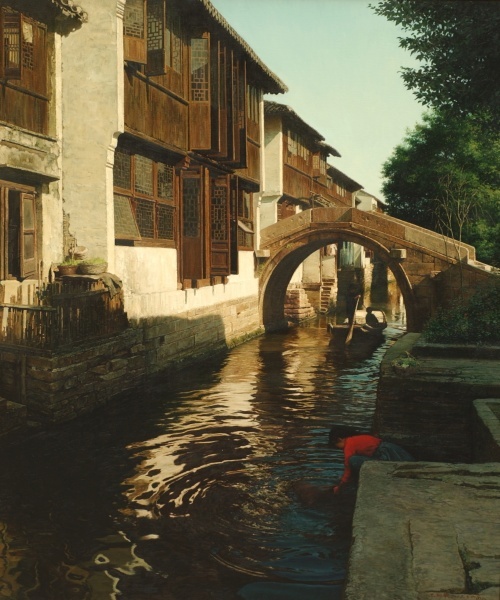 In viewing these works, we are drawn into the peaceful scenes with their seductive surfaces, feeling that while we may be outsiders to the canal villages and their suspension in time, we may experience some of Wang's nostalgia in their manner of technical execution. The paintings remind us that inspiration may still be found in the physical world, and that beauty still has the power to move us. For more information about Wang Yihua's oil paintings please contact the gallery curator at rafael@odonwagnergallery.com or by phone at +1 (416) 962-0438. To view the available collection of Wang Yihua’s artworks at Odon Wagner Contemporary please CLICK HERE (you will be redirected to another page on this website).